Thus Spoke Zarathustra, the most famous and influential work of Friedrich Nietzsche, is a philosophical novel that articulates the themes central to Nietzsche's mature thought—a rejection of religious morality, the will to power, and the idea of the "overman"—through the religious prophet-like character of Zarathustra. Composed in four parts between 1883 and 1885, Thus Spoke Zarathustra is the most famous and influential work of German philosopher Friedrich Nietzsche. The work is a philosophical novel in which the character of Zarathustra, a religious prophet–like figure, delivers a series of lessons and sermons in a Biblical style that articulate the central ideas of Nietzsche's mature thought. Key to the philosophy of Thus Spoke Zarathustra is a rejection of traditional systems of religious morality, the idea of the will to power, and a vision of a new, higher mode of being, the "übermensch" or "Superman," one of Nietzsche's most famous and controversial figures. As innovative stylistically as it is philosophically, Thus Spoke Zarathustra is both a literary masterpiece and an enduring classic of moral thought. 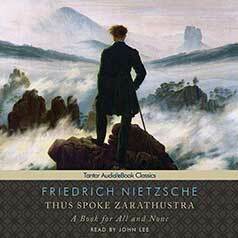 This version of Thus Spoke Zarathustra is the translation by Thomas Common.